According to physiotherapists 80% people experience back pain at a certain stage of their life. It is one of the major reasons that people visit a doctor or physiotherapist. Fortunately, with proper care and treatment, back pain can be managed. One of the best yet most natural treatments is exercise regularly, especially Yoga or Pilates as they can focus on functional body movements. As far as external products go, Emu Tracks Muscle and Joint Balm is one of the proven to be effective products to help relieve muscle and joint pain. It is formulated using natural extracts and Pure Emu Oil to target inflammation and relieve pain. 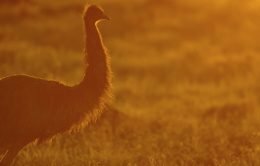 With its powerful anti-inflammatory properties and superior penetrating properties, Emu Oil can penetrate the outer layer of skin and improve the circulation to speed up the recovery process. Experience the power of ET Muscle and Joint Balm to soothe away stress and sore muscles and joints. It can also be used before and after exercise to prevent injuries and assist in circulation.